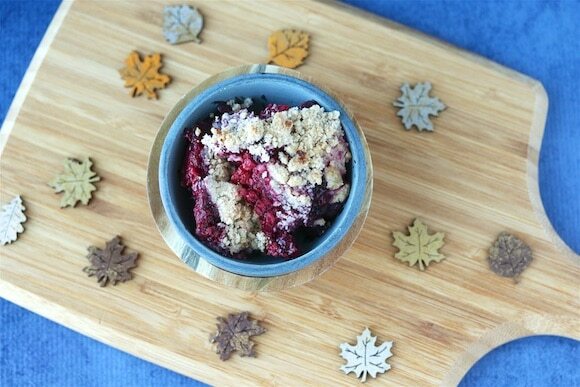 I’m sharing a healthy Berry Crumble recipe today that is gluten-, and dairy-free! The secret to the grain-free topping is cassava flour, an ingredient I’ve been using for about a year now with great results. Before sharing more pictures and the recipe, though, I have to tell you some very sad news. This past weekend Alan and I love our beloved cat, Xena. 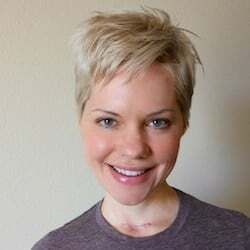 She had a genetic dental disease that required annual cleaning under anesthesia, and due to what will forever be unknown, the surgery on Wednesday morning led to some complications starting Thursday afternoon. She became very sick very quickly, so sick that Alan and I had to make the hardest decision of our lives to let her go without further stress or discomfort. My beautiful fur-baby died in my arms around 5 p.m. on Saturday, December 3rd. She was 12 1/2 years old and the light of my life. I am now writing this post on the afternoon of Thursday, December 8th, and it has taken a full five days to even begin to feel normal. If you subscribe to my weekly newsletter, then you have heard this news and may have already reached out to me. If so, thank you. Your support, along with that from my friends and family, got me through the worst sorrow I have ever felt. I feel lucky to have made it through the worst of the pain. I hope this isn’t too depressing of an update for you, but I always want to be genuine about what I’m going through and how I’m feeling. Make this for yourself and please let me know how you like it. This is a grain-free healthy dessert that is both paleo-friendly and vegan. Spray an 8”x8” glass baking dish lightly with non-stick cooking spray and set aside. Combine the blueberries and strawberries in a mixing bowl, and stir in the vanilla extract and lemon juice. Pour the mixture into your baking dish. 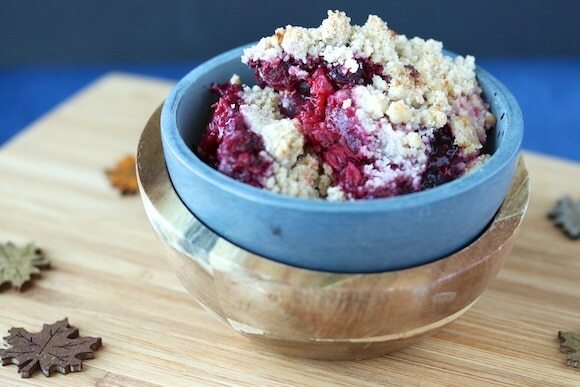 To make the crumble topping, stir together the cassava flour, coconut flour, coconut sugar, baking powder, sea salt, and coconut oil in a clean bowl. Use your hands if necessary to ensure that the mixture becomes crumbly and not dry. 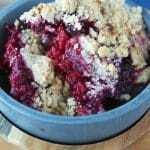 Use a tablespoon to drop the crumble mixture on top of the berry mixture, spreading it out as evenly as possible. Bake the mixture for 45 minutes, or until the topping starts to brown. Remove from the oven and let cool for at least 10 minutes before eating. If you like, serve with a dash of your favorite dairy-free milk, yogurt, or ice cream, for added creaminess. As mentioned, I’d love to stay connected with you by e-mail! Sign up here to receive my weekly newsletter with all the latest news and insider info. Sign up now and unsubscribe at any time. I will never sell your name or spam you. I promise. Oh, I am so sorry to hear! We lost our gorgeous dog last year and I cried and cried until there was no more tears in me. I feel your pain. So sorry for the loss of your family. Thank you for this delicious looking recipe. Love to you and your husband. Thank you, Christine. I’m so sorry to hear about your loss as well. This is a pain I have never known before, but it’s getting easier to manage with each day. I know it will always hurt, but I’m grateful that I have things in my life that still bring me joy. There were times this past week when I wondered if I would survive this loss. I’d love to know if you have other pets at home or if you are thinking about getting another dog? I have been a cat-mom for so long that I can’t help but think about if and when the time will be right to consider adopting another kitty. The challenge will be to make sure I’m in a space when I’m not trying to replace Xena or trying to find a cat that is as wonderful as she was. Thank you for your words of support. XOXO. Hi Jessie, thank you for such a beautiful message. What a wonderful suggestion to write memories in a journal. I actually started writing the story of Xena’s life the day after she died, along with all of the nicknames I had for her (of which there were at least 30). I never, ever want to forget a detail about my precious kitty, including the noises she made and her scent (she smelled like a cinnamon roll). I am also finding solace in how much love Alan and I were able to give to her, and how incredibly spoiled she was. I think you’re right that I’ll know when the time is right to adopt another kitty. My instinct is to want another one right away, but I know it’s too soon and I would only be trying to replace what I have lost. Losing something so precious represents the hardest part of life. I am so thankful to have the strength and support of my loved ones, including my virtual friends like you. Thank you. XO. I am so sorry. Over the years I have had and lost several cats. I always envision my self arriving I. Heaven, standing on a grassy hill and all of them running out to greet me in that way cats do. I sit right down and they all get in my lap, or rub me with thier faces or lay belly up beside me. It makes me happy to think if that and that they will be there waiting for me. Thank you, Andrea. I love that imagery as well. It’s taking me some time to forget about the trauma of seeing her sick and hurting and to remember the other 99.99% of the time when she was comfortable, purring, warm, snuggly, and blissfully happy. XO. We lost our kitty of 16 plus years right after last Christmas. As with Jesse, this pet was around through a large part of our children’s lives. It does hurt so very much. About two months later I went to a cat rescue place and brought back Bob. A silly looking young troublemaker! He will never take Poco’s place, but he has filled our quiet house with all sorts of antics, and has brought us a lot of joy. It seemed soon, but this little skinny cat needed a home and the care he needed to adapt to our home and put on some weight gave us something positive to do. You will know when you are ready. Peace and healing to you and yours. Hi Mary Sue. Thank you for bringing a smile to my face when I read your story of bringing home your little trouble-maker, Bob. It’s nice to know that you’ve been able to open up your heart to a new fur-baby without forgetting your love for Poco. I suppose at this point, I’m still adjusting to this new life without Xena here at home watching my every move. She was such a big part of my daily life, and it’s the bitter, bitter reality that no amount of grieving will bring her back. I miss her so much, but I’m hopeful I’ll find a place where I can think of her without feeling that terrible ache of missing her and wanting her back. Thank you. Sorry for your loss. No words ever seem to be the correct ones. It hurts & I wish there were something I could do to make you & Alan feel better, but only time can do that. Thank you Paula. Your kind words and sensitivity mean so much. XOXOXOXOXOXOXO. I keep making this recipe I love it so much.